No, they are not doilies. They are jabots. And they all have special meaning! And we ranked them! 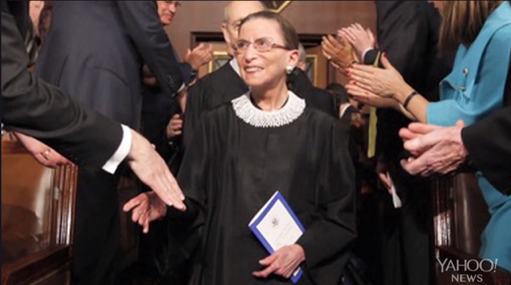 Ruth Bader Ginsburg loves a good jabot! And we now know that she has a jabot for every occasion, thanks to an interview Ginsburg did this week with Katie Couric for Yahoo News. But which is the jabot to rule them all? Let's talk about it. 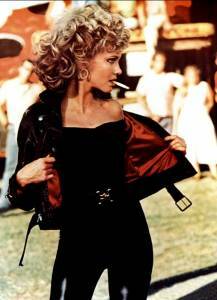 Ginsburg told Couric she wears this particular collar when issuing her dissents. Because nothing says, My male colleagues have just opened a minefield and massive screwed women over better than black velvet and studded bling. This is Ginsburg's personal favorite, she says. And while she didn't provide any occasion specific details about when she wears it, I'd like to think she angrily ran her fingers against the smooth beading while Justice Sonia Sotomayor penned her dissent on her male colleagues' about face on the contraception accommodation in the Wheaton College injunction. The collar just oozes, "That action evinces disregard for even the newest of this Court’s precedents and undermines confidence in this institution," right? I can totally picture "The New Girl" actress wearing this one. It is very adorkable, you know? This one is from the Metropolitan Opera gift shop, which seems like a kind of mundane place for a Supreme Court justice to purchase her collars. 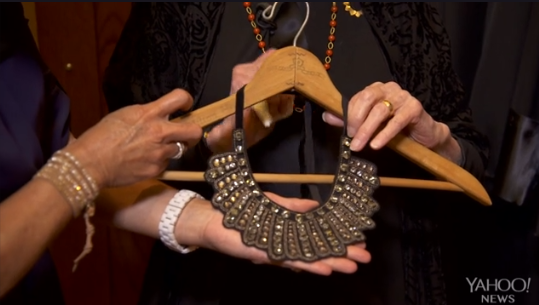 It's a copy of one worn by opera singer Placido Domingo, who serenaded her when she received an honorary degree at Harvard and whom RBG maybe possibly has a crush on. This could just be me, but I feel like her majority collar -- with its Etsy crotchet aesthetic -- feels more like it should be RBG's Coachella jabot. I'd encourage her just go with the badass dissent collar in all cases moving forward. It's a show stopper, kind of like Ginsburg's legal brain.